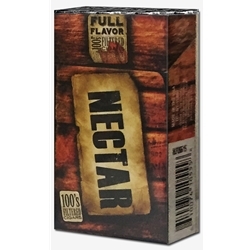 Nectar Filtered Cigars are manufactured from premium grade tobacco and infused with rich fruity essences that provides a fine draw and an even burn. Each taste of these discount filtered cigars have been carefully created to give a truly authentic experience, ensuring that every inhalation delivers an appealing blend of tobacco and rich, fruity fragrance. Nectar Filtered Cigars have become a very popular choice with a growing number of people now preferring a smaller filtered cigar over their expensive retail brands. Nectar Filtered Cigars are distributed nationwide by Seneca Manufacturing Co., Salamanca, NY, Seneca Nation. Each filtered cigar offered here comes in multiple styles to choose from. Full Flavor, Lights, Ultra Lights, Menthol, Menthol Lights, Grape, Peach, Vanilla, Cherry and Robust. Filtered little cigars are an excellent choice for smokers looking for a relaxing way to enjoy a great quality smoke at an inexpensive price. Here at Smokers Discounts we’ve made it easy and affordable to buy filtered cigars online. Call us for more details!